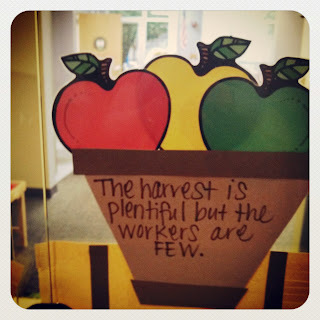 This just happened to be on the window of LJ's classroom today. "JP and I are both speechless. 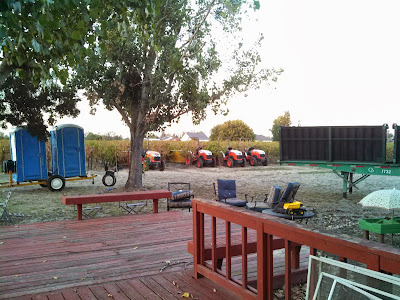 This morning the pickers arrived for our 3rd harvest. 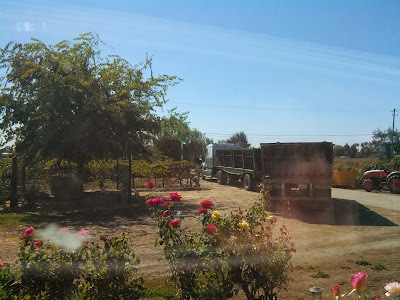 As we watched them start picking and loading the grapes into the bins our excitement built. This may actually work this year. This crazy adventure we started on a little more than 2 years ago may actually start to pay off." 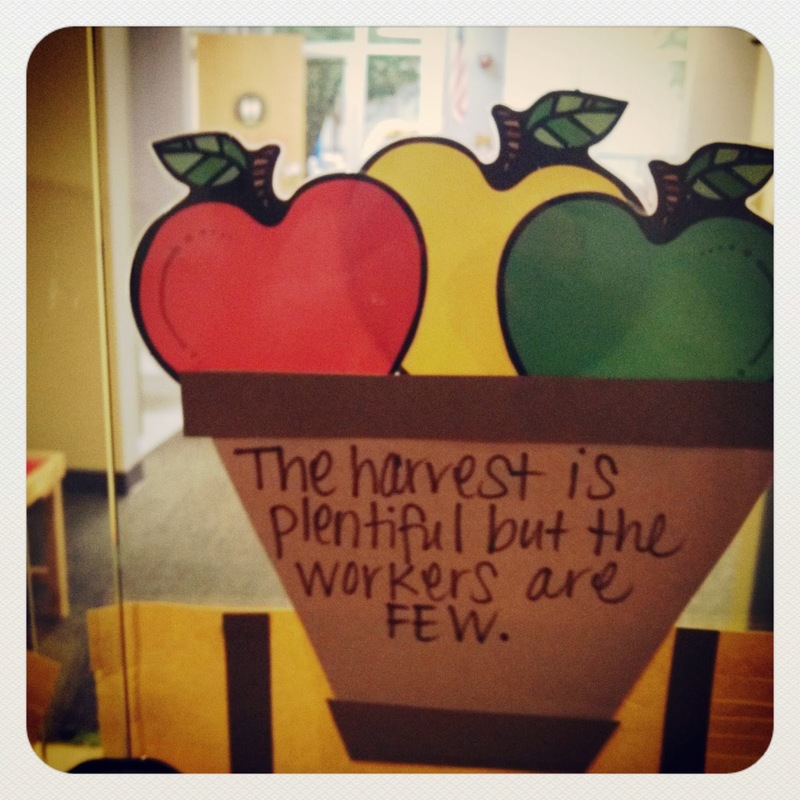 It says in the Bible that "the harvest is plenty, but the workers are few." That verse applied to our life quite literally this year. Growing up as a city boy I always applied the standard Christian evangelical meaning to that verse. Today as a farmer it takes on a whole new meaning. Some of the many wonderful workers who came out to pick! 10 days ago we found out that our grapes had reached the necessary sugar level and were ready for harvest! We were ecstatic! Then... 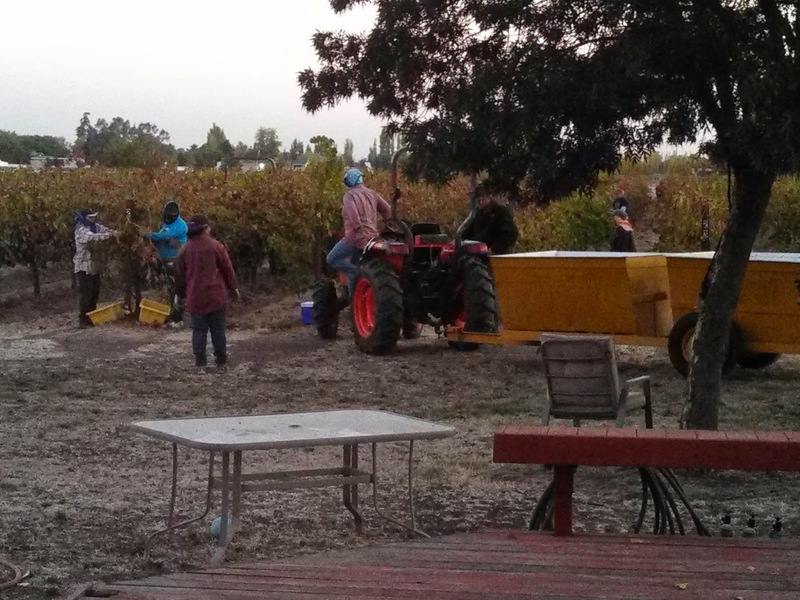 I got a call from our vineyard manager who said he didn't have enough workers to pick our grapes. Major buzz kill. So, I started to make calls to other vineyard managers only to find out that everyone was swamped and low on manpower this year. 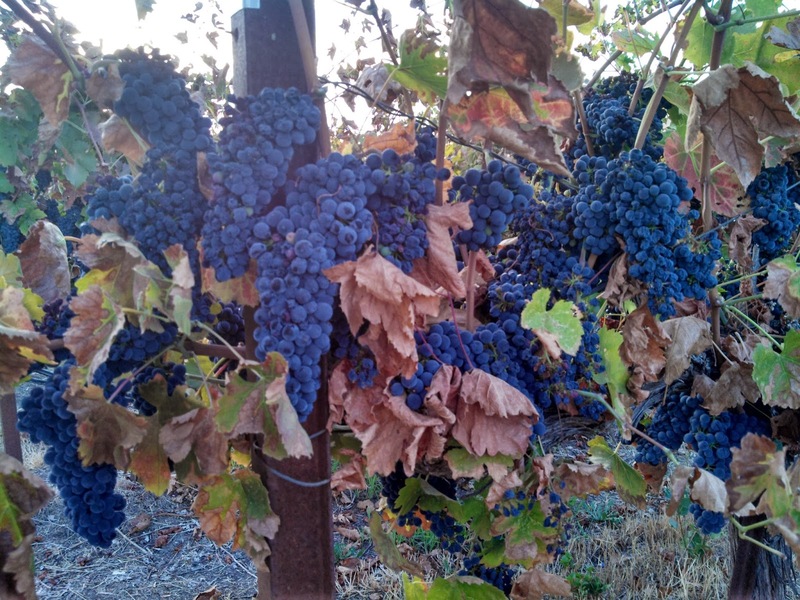 Not something you want to hear when your grapes are ready and rain is in the forecast. 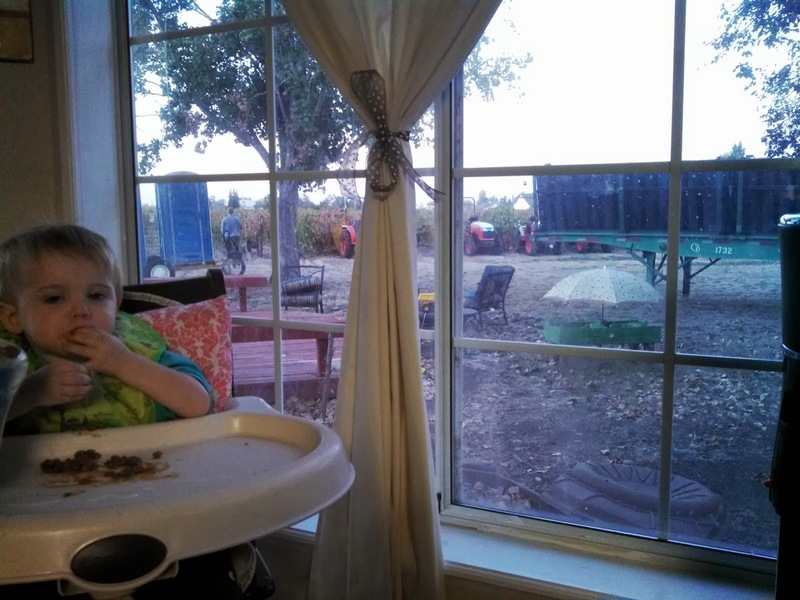 (This time of year rain can wipe out a crop and leave you stuck with no income and a bunch of bills.) All that to say, yes, this year that verse had an urgent significance to it. ﻿﻿﻿﻿﻿﻿But, we serve a big God, so with a little prayer and support from our great partner at Gallo Family Wines, we found an elite vineyard manager in our area who agreed to come harvest our Petite Sirah grapes and we gained more favor in the wine world. The crew ended up having to work an EXTRA day because we had more grapes than anyone anticipated! Doesn't everyone have a porta-potty and a semi trailer in their backyard? To give you an idea of the significance of this year, let's break it down. We bought our house in August 2011. It was a foreclosure property that had little care for several years. We harvested two months later and produced 8 tons. 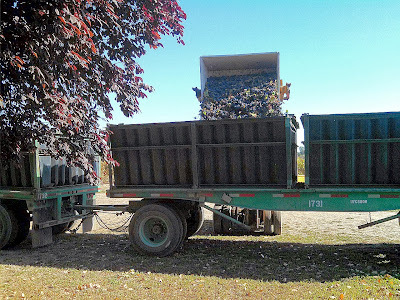 The next year we hung on for dear life financially and did major work making up for years of neglect, only to produce 2 tons of grapes in 2012. That was one of the hardest days of my life, trying to find meaning and hang on for another year. Beck told me earlier this month that if we didn't get a good harvest this year then maybe we should use that as a sign that this life was not the Lord's will for our family. Well, He heard her and physically showed us that we are in His will and blessing. This has been a real growing year for us as we've seen first hand how, when you live life in close relationship with Jesus, in the moment when you're not sure how things are going to work out and you're broke and have a pile of bills to pay, God comes through in a big way! This has been evidenced to us in more than just grapes this year, but that's not why you're reading right now. So, without making you wait any longer, we are proud to announce that we produced 28.4 tons of grapes at 25.35 sugar this year. The minimum sugar level we had to hit was 24 and we exceeded that mark by over a degree, which is significant in wine world. We produced 6.3 tons of grapes to the acre. And we believe that with some key changes and some more expert help we can increase our yield and quality significantly for next year. We've been learning that in life when you work hard, take risks, surround yourself with good mentors and experts, and ask the good Lord for favor, things come together and you see rewards for your efforts. It says in the Bible that God is the "Lord of the Harvest." Well, we can testify to that in more ways than one! The sound of these babies going into the truck was music to our ears! If you asked me ten years ago if I thought I would be a banker by day/farmer by night, or if I thought I would get up in the morning and gather fresh eggs from my chickens and enjoy my morning coffee overlooking my vineyard, I would have said you were crazy. I am glad life has not gone as planned, but that's why we put our faith in the adventure of walking with Jesus. He never promised it would be an easy journey, but it's definitely exciting. 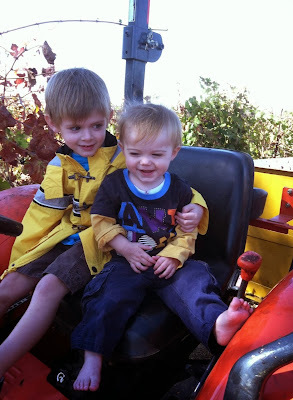 Our biggest blessings helping out on one of the tractors. I think OSHA might take issue with the lack of footwear. Beck and I think the world of blogs and social media has created unhealthy self-reflection of comparing your life to the lives of others. The thing is, your life is your adventure and your story and it doesn't compare to the journey anyone else is on. This one happens to be ours. Thanks for reading and sharing in our adventure! Bye grapes! Go make some really great wine!